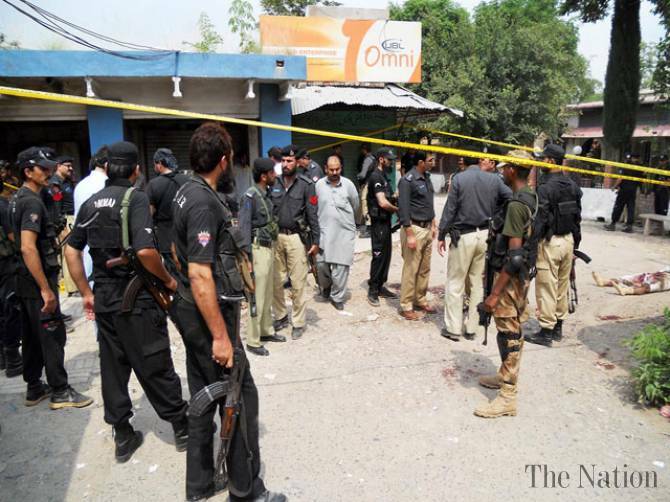 Islam Around Us: 1 security man killed, 6 injured in militant's attack on district court Kohat. 1 security man killed, 6 injured in militant's attack on district court Kohat. The Nation | 09 Sep 2013 :: One security man was killed and six injured when armed militants attacked office of DPO Kohat located in the premises of district court on Monday. According to DPO Kohat office, eight to ten militants attacked district court with hand grenades and heavy arms. Exchange of fire took place between the attackers and security forces within the court premises as four security men were reported injured. Two attacking militants were also killed as the security forces retaliated the attack, informed an official of DPO office. While remaining attackers escaped from the scene. Presently Police has surrounded the area and evacuated people from the court and offices.